I love when the temperatures finally begin to drop and you can smell fall in the air. Even the light changes, giving everything a warm golden hue. As summer turns to fall, it ushers in one of my family’s favorite things – College Football. Game day parties are a great way to gather friends and cheer on your home teams while enjoying time together. Now, no game day would be complete with out game day food and one of our cherished traditions is piping hot slow cooker chili. I purchased Hurst Slow Cooker Chili Beans from my local Publix and followed the recipe on the package. 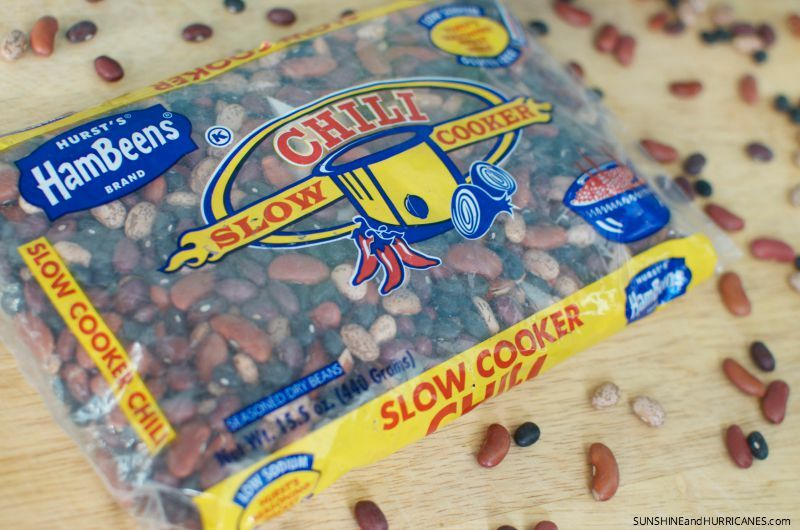 I like these slow cooker beans because they don’t require pre-soaking. Simply rinse and then sort through and discard any unwanted debris. Brown the ground beef and drain off any grease. Then pour the beans and ground beef into the slow cooker together. Set the slow cooker to low and cook for 8-9 hours. Yoou can also run on high for 4-5 hours, but I’m going to be really honest. 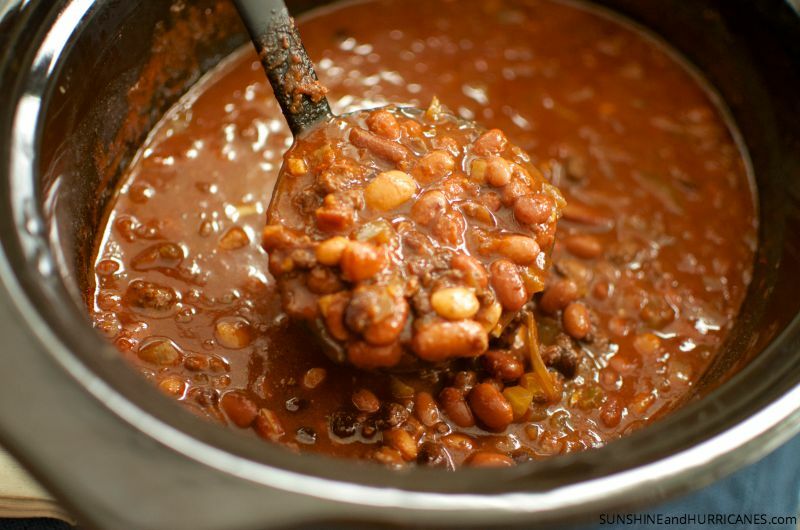 When it comes to slow cooker chili, that long low heat really is what brings out the flavor. After the initial cooking period (low or high whatever you chose), add the diced tomatoes and the tomato paste and then cook on low for another 30-60 minutes. Keep the slow cooker chili on warm until you are ready to serve. The longer on warm the more the chili will thicken and the flavor will intensify. I actually did the first round of slow cooking overnight, added the tomato ingredients in the morning, and then left it on warm all day until supper time. Add any toppings that your family likes, such as cheese, chopped onions, sour cream, avocado. For a game day party you can even make a chili bar with the slow cooker and serving spoon at the front of the table and bowls and spoons for everyone and then all the toppings laid out across the table for guest to choose from. Chili is also great on Nachos, so another option for game day or a way to use leftovers for another meal later in the week! You can head on over to the Hurst Beans website to print this slow cooker chili recipe and to get other great slow cooker meal ideas! Want EVEN MORE fast family dinner ideas? Follow Sunshine and Hurricanes ‘s board Fast Dinners on Pinterest. 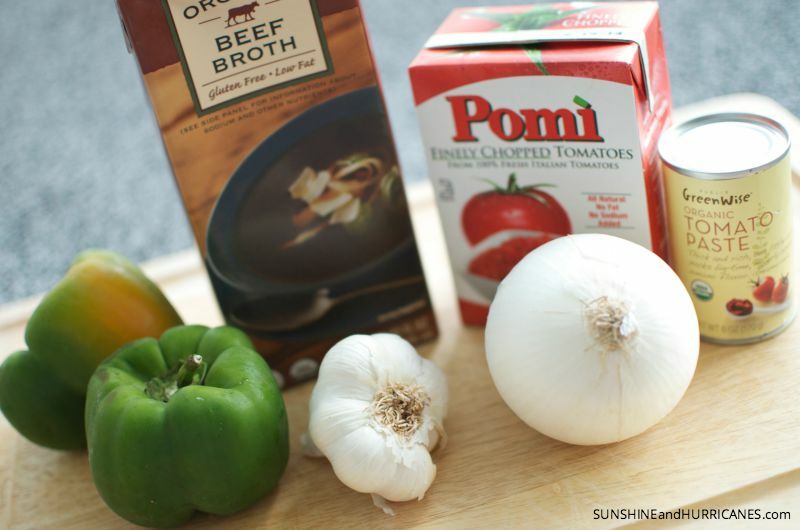 What are your favorite toppings for slow cooker chili? Chili is one of my all time favorites, I wish my kids would eat it. this seriously looks scrumptious! Thank you for the recipe I definitely will be cooking this!! Gotta love us some chilli! Yum. Chili is my favorite fall dish! I have never cooked it in a slow cooker though. I have to try some of your chili recipes. They all look delish! This is the perfect time of year for chili! And a crockpot full is perfect for weekend football watching. I love making chili! It’s so filling, and I love topping it with sour cream. And, I had no idea that ‘slow cooker’ beans actually existed – I have never seen anything like that before. I used to hate chili, but now I love it. I always make mine in the crockpot so I’m with you on this one. It is the perfect time of the year for chili. I love a good recipe. 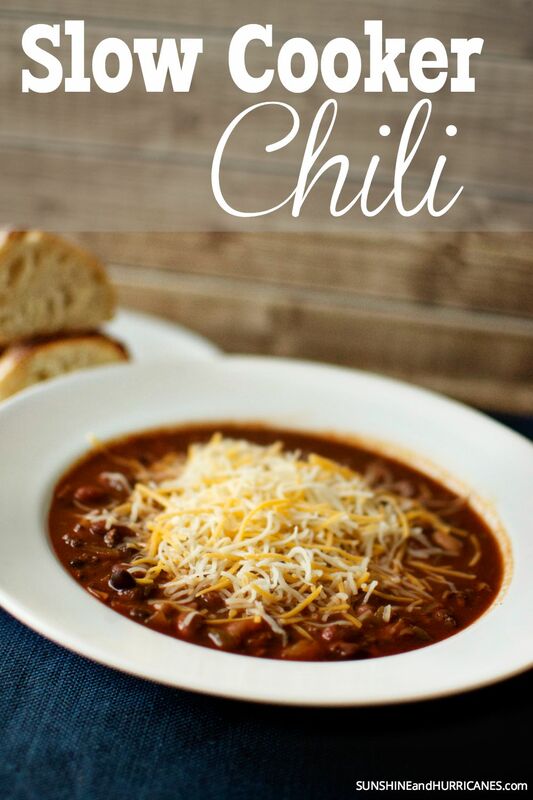 We love chili and are always looking for new recipes to try. I have to admit that I’ve never used dry beans before. I thought it would be much more difficult to cook. Not only is this a yummy fall recipe, but perfect for football season!! I love using my slow cooker and this looks like the perfect excuse! Thanks for sharing! Ohh man! Chili is so delicious this time of year. I am going to have to make some really soon! I have never tried it with dried beans! I will definitely give this recipe a try!